Unlike the horrifying post-revolutionary animalpocalypse world depicted in the comic strip Slylock Fox, TaleSpin does not have any humans. There are anthropomorphic animals, and there are regular animals, but there's no evidence that humans were ever a thing. 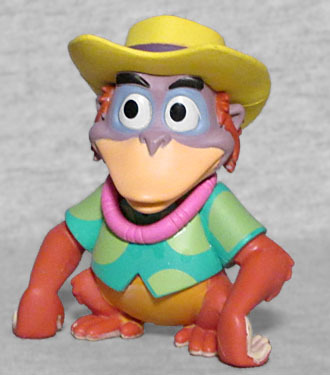 So it makes sense that Louie, the orangutan who wanted nothing more than to be human, seems to have given up that aspiration - he has a more distinctly simian posture in the TV series than he did in the movie, because he's already the best him that he can be. Louie runs a bar/gas station where all the pilots based in Cape Suzette stop to refuel. In keeping with the party atmosphere Louie's Place maintains, he's wearing a Hawaiian shirt, a straw hat, and a lei. The only thing missing is a fruity drink with an umbrella in it! Of course, that would probably be a little risqué for a Disney toy to come with, and it would also mean he was no longer able to walk on his knuckles. 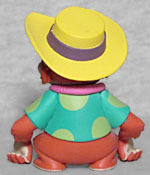 In the cartoon, Louie was voiced by Jim Cummings, doing a spot-on impression of (original voice actor) Louis Prima - something that became an issue with Prima's widow, who felt he hadn't been paid all the royalties he was owed for The Jungle Book. So now here was a syndicated show copying his distinctive voice without permission (or, again, paying). She sued, Disney settled out of court, and TaleSpin was the last time King Louie sounded like King Louie. Louie was available exclusively at Toys Я Us, where he could be found in a 1:6 ratio - in other words, two per case.